When reporter Ellen Gleeson gets a “Have You Seen This Child?” flyer in the mail, she almost throws it away. But something about it makes her look again, and her heart stops―the child in the photo is identical to her adopted son, Will. Her every instinct tells her to deny the similarity between the boys, because she knows her adoption was lawful. But she’s a journalist and won’t be able to stop thinking about the photo until she figures out the truth. And she can’t shake the question: if Will rightfully belongs to someone else, should she keep him or give him up? She investigates, uncovering clues no one was meant to discover, and when she digs too deep, she risks losing her own life―and that of the son she loves. Chosen as Target’s Bookmarked Book Club Pick, and chosen as One of the Best Novels of the Year by The Washington Post! Ellen Gleeson was unlocking her front door when something in the mail caught her attention. It was a white card with photos of missing children, and one of the little boys looked oddly like her son. She eyed the photo as she twisted her key in the lock, but the mechanism was jammed, probably because of the cold. Snow encrusted SUVs and swingsets, and the night sky was the color of frozen blueberries. Ellen couldn’t stop looking at the white card, which read HAVE YOU SEEN THIS CHILD? The resemblance between the boy in the photo and her son was uncanny. They had the same wide-set eyes, smallish nose, and lopsided grin. Maybe it was the lighting on the porch. Her fixture had one of those bulbs that was supposed to repel bugs but only colored them yellow. She held the photo closer, but came to the same conclusion. The boys could have been twins. Weird, Ellen thought. Her son didn’t have a twin. She had adopted him as an only child. She jiggled the key in the lock, suddenly impatient. It had been a long day at work, and she was losing her grip on her purse, briefcase, the mail, and a bag of Chinese take-out. The aroma of barbequed spareribs wafted from the top, setting her stomach growling, and she twisted the key harder. The lock finally gave way, the door swung open, and she dumped her stuff onto the side table and shed her coat, shivering happily in the warmth of her cozy living room. Lace curtains framed the windows behind a red-and-white checked couch, and the walls were stenciled with cows and hearts, a cutesy touch she liked more than any reporter should. A plastic toy chest overflowed with plush animals, Spot board books, and Happy Meal figurines, decorating never seen in House & Garden. “Mommy, look!” Will called out, running toward her with a paper in his hand. His bangs blew off his face, and Ellen flashed on the missing boy from the white card in the mail. The likeness startled her before it dissolved in a wave of love, powerful as blood. “Hi, honey!” Ellen opened her arms as Will reached her knees, and she scooped him up, nuzzling him and breathing in the oaty smell of dry Cheerios and the faint almond of the Playdoh that stuck to his overalls. “Just fine.” Connie answered, which was only one of the reasons that Ellen counted her as a blessings. She’d had her share of babysitter drama, and there was no feeling worse than leaving your child with a sitter who wasn’t speaking to you. “He traced it from a coloring book,” Connie said under her breath. She crossed to the coat closet and retrieved her parka. “I drew it!” Will’s forehead buckled into a frown. Will pouted, a mood-swing typical of toddlers and manic-depressives. “I drew it,” Will said, cranky. Will was supposed to say ‘alligator,’ but he didn’t. His lower lip was already puckering. “You wanna say good-bye?” Connie asked. Will shook his head, his eyes averted and his arms loose at his sides. He wouldn’t make it through a book tonight, and Ellen loved to read to him. Her mother would turn over in her grave if she knew Will was going to bed without a book. Ellen felt a twinge of jealousy, however unreasonable. “Thanks again,” she said, and Connie left, letting in an icy blast of air. Then she closed and locked the door. “I DREW IT!” Will dissolved into tears, and the drawing fluttered to the hardwood floor. “Come here, sweetie.” Ellen reached for him but her hand hit the bag of Chinese food, knocking it to the floor and scattering the mail. She righted it before the food spilled, and her gaze fell on the white card with the photo of the missing boy. She picked up the bag of Chinese food and left the mail on the floor. 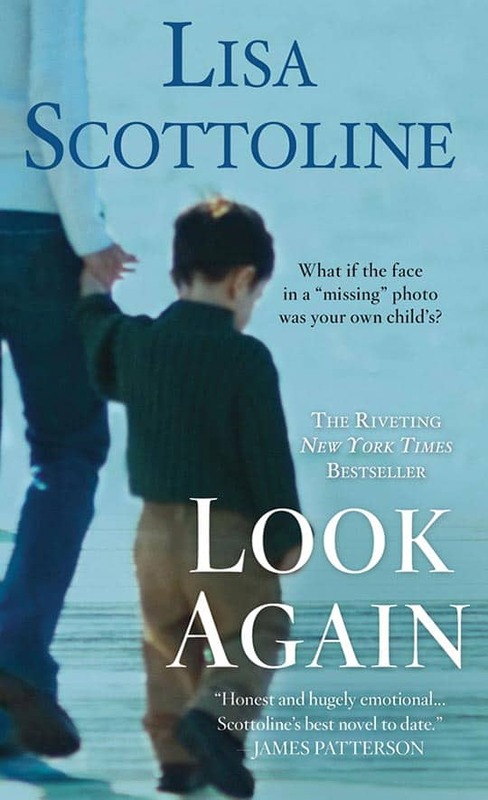 Lisa Scottoline discusses her new book, LOOK AGAIN. Look Again really examines the notion of parenthood. What do you think makes someone a parent? Do you think the bond a child has with a non-biological parent can be as strong as one they would have with a biological parent? Why? Lisa’s favorite quote is one from Eleanor Roosevelt, “A woman is like a tea bag. You never know how strong she is until she’s in hot water.” How does Ellen prove that she is a strong woman? Does Ellen remind you of anyone you know? Could you relate to Ellen, and did you like her? Why or why not? As a journalist, Ellen has a heightened need to find the truth. In this circumstance, was this a good thing, or a bad thing? What would you have done in Ellen’s place? Would you have looked for the truth, even if it meant losing your son? What do you think were Ellen’s motivations? The idea of “letting go” a child helped shape the whole premise of the book for Lisa, which led her to thinking about who really “owns” a child. Who do you think “owns” a child, and what exactly does that mean? If children actually “own” themselves, what then is the role of parents, and what are the limitations on parenthood? If the child you raised and loved with all your heart actually belonged to someone else, and you were the only one who knew, would you give the child up? How do you think those around you would react? Who in your life would agree with your decision, and who would have done the opposite? How would you describe Ellen’s relationship with her father and how do you think it changed over the course of the book? Ellen considered her mother her go to parent. Do you think everyone has a go to parent, and what defines them as such? What effect do you think all the drama in Will’s life will have on him in the future? Do you think things ultimately worked out to his benefit or detriment and why? How do you feel about single parents adopting children? What kind of, if any, additional requirements do you think should be put on single parents before they can adopt? How do you feel about open adoption? Is it better or worse for children? Is it better or worse for the adoptive parents? The biological parents? At what age do you think a child should be told they are adopted?